This instructional video teaches you how to visually push a real coin through the bottom of a real glass bottle, leaving it inside. They watch it melt through the bottle's bottom, leaving your hand and falling into the bottle. They don't see it just 'appear' in the bottle, they watch it melt through. The bottle is then handed to spectator for inspection and to keep. 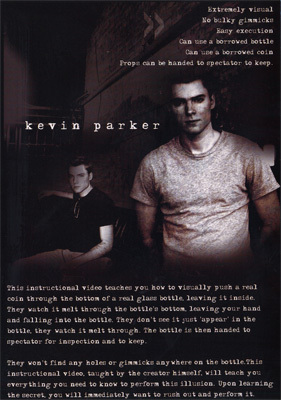 They won't find any holes or gimmicks anywhere on the bottle.This instructional video, taught by the creator himself, will teach you everything you need to know to perform this illusion. Upon learning the secret, you will immediately want to rush out and perform it. his is a very cool illusion. If you want something thats " in your face " type of illusion , this is it! Mr. Parker does very well in the video, you can really understand everything and easily follow along. Easy to do, but will take a little practice to pull it off like the video. This a great effect which is very easy to do. It's rare that one comes across a trick that is so simple and yet so mind-bogglingly stunning. The audiance is left with a great souvenir that they will puzzle over for years. The only con is that it's a little tough to ditch the gimmick, but other then that it's amazing. This product was added to our catalog on Saturday 10 June, 2006.